If your facility requires monitoring by security personnel, they need somewhere they can go to stay out of inclement weather and between their rounds. A guard booth is the ideal solution. By creating a dedicated space that keeps your employees’ needs in mind, they will be more comfortable and productive. Learn the benefits of guard shacks in today’s blog. A guard shack will keep your employees safe and comfortable. One of the biggest benefits of adding a guard shack to your grounds is the fact that it will provide your security personnel with a protected and sheltered area where they can stay between rounds. At Shelters Direct, we keep the comfort of your employees in mind which is why we can include heating and AC in your prefabricated guard shack to keep them comfortable in any kind of weather. A guard booth can easily and quickly be installed at your facility. Our booths are pre-fabricated in our factory and delivered to your facility ready for use. A simple final connection to the load center is all that is needed after anchoring it to a concrete pad. While keeping your employees out of the elements will help to keep them safe from many hazardous conditions, if your facility requires added security then we can install a bullet resistant guard booth for your security personnel. 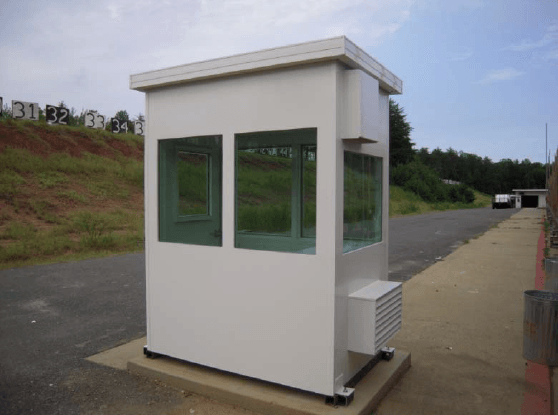 Our UL 752 bullet resistant guard booths can be constructed to repel different types of ammunition depending on the type of threat that your facility is at risk of facing. By investing in a durable and secure guard shack, you will communicate to your security personnel the fact that their safety is your top concern. Shelters Direct has been a trusted source for the supplying and installation of canopies, shelters, and prefabricated guard booths for over 20 years. We work with a wide variety of clients throughout the United States and abroad to provide quality products and expert installation so you can be confident that we will get the job done right. No matter what type of guard shack your business needs, we can construct and install the appropriate model for you. Interested in learning more about how a smoking shelter could benefit your business? Contact us today! And don’t forget to keep up with us on Facebook, Twitter, Google+, and LinkedIn too. This entry was posted on Thursday, July 14th, 2016	at 2:44 pm	. You can follow any responses to this entry through the RSS 2.0	feed. Both comments and pings are currently closed.